Wagon wheel pasta is the perfect pick to go with this easy, cheesy chicken and pasta casserole. Microwaving cuts down on prep time to create a super-speedy supper. 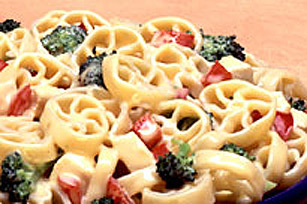 COOK pasta according to package directions, adding red pepper and broccoli during last 2 minutes of cooking; drain. MIX cheese, sour cream and onion in 2 L microwaveable casserole. Heat on MEDIUM power 1 to 2 minutes; stir until smooth. STIR in pasta, broccoli, red pepper and chicken. Cover and heat 2 minutes more. Serve immediately.